For the first time ever, Panasonic Visual Systems and NovaLine used a new technology capable of displaying realistic looking holograms during the four "Holland zingt Hazes" concerts staged in honour of André Hazes at the Ziggo Dome. The hologram of the star was projected onto a new invisible NovaLine screen injected with nanotechnology. The images were projected using Panasonic's PT-RZ31KEJ laser projector, which is one of the most advanced 30K laser projectors on the market. Fans who witnessed André Hazes' "appearance" on stage during the first concert held on Friday 17 March were both excited and moved. The screen onto which the hologram of André Hazes was projected during "Holland zingt Hazes" was designed by fledgling company NovaLine. Measuring 15 metres wide and 3 metres high, it is invisible to the audience and is injected with a special nanolayer which, when combined with a laser light, can create a very bright and realistic looking image. The audience was pleasantly surprised by the hologram during the first concert. No one could see the screen, let alone the Panasonic projector which was hidden from the audience as it was integrated into the stage and positioned immediately in front of the screen. The screen is curved to allow visitors to see the image from all angles and take good photos without any issues. 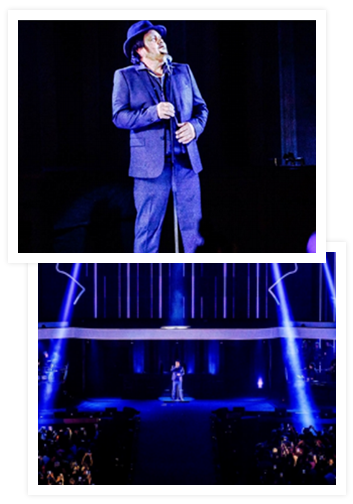 The images of André Hazes who whilst appearing on stage sang one of his biggest hits "Zij gelooft in mij" were produced by NovaLine which develops innovative visual solutions for events, shows and digital signage. "The event producers and the Hazes family felt that the hologram was a wonderful way of celebrating the 5th edition of the concert"
The company worked on the images in close collaboration with André Hazes' family for more than a year. The actor Martijn Fischer, who also played the lead role of André Hazes in the musical comedy "Zij Gelooft in Mij" and the film "Bloed, zweet & tranen", was used as the model for creating the hologram. Photos and videos of André were also used to perfectly recreate all of his facial features. The producers deliberately chose a classic projection of André. Although black can sometimes be problematic in projections, the high quality of the colours and images meant that André was able to appear in his signature black suit and black hat. "Holland zingt Hazes" was the first event where fledgling company NovaLine had the opportunity to unveil its new screen. "We spent more than two and a half years working on the materials that are used in the fabric of the screen. The event producers and the Hazes family felt that the hologram was a wonderful way of celebrating the 5th edition of the concert", said Liam Mahon, Market Developer at NovaLine. "The screen is a completely new solution for holographic displays. The canvas measures 15 x 3 metres, weighs 2 kilos and is invisible to the human eye, but is also very robust. When designing it, we used new nanomaterials with amazing properties. The screen captures only the light from the laser projection and absorbs all other light sources, so the audience not only sees a very accurate hologram but can also see through it. "Other materials eliminate image distortions and undesirable lighting effects. A new antistatic material prevents dust from settling on the screen to ensure that it remains completely invisible at all times. We have high hopes for this new screen, not only for events and shows but also for museums and shop windows, for example." Furthermore, "Holland zingt Hazes" was a fantastic opportunity for Panasonic Visual Systems to showcase itself. "We were contacted by the concert organisers and asked to provide a laser projector capable of projecting the hologram", recalls Ben Moors, Sales Project Manager Benelux at Panasonic. "We suggested the PT-RZ31KEJ laser projector. With a brightness of 31,000 lumens, it's our flagship product. It is a well-known and very popular projector in the rental sector and for mapping projects on account of its image quality. "It is also used all around the world for large-scale events. For this specific projection project, we used a 3-inch Ultra Short Throw lens which allows you to position the projector very close to the screen. With "Holland zingt Hazes", we wanted to show Dutch companies what our technology and laser projectors are capable of."